We were delighted to have received not one, but two, wonderful accolades at the Meat Management Awards in London last month. Coming away with Britain’s Best Lamb product for his Lamb cutlet with parmesan and herb crust, Creative Butcher Martin has proved again why he is considered on of the best Butchers in the UK and happily adds another title to his achievements. Award winning Food Hall, Aubrey Allen of Warwick street Leamington Spa have once again scooped prizes equivalent to the Bafta’s in the Butchery Industry. The Q Guild Smithfield awards, named after the famous City of London meat market, run every year when Butchers the length and breadth of the country are challenged to enter their best products and judged by the top tasters in the industry. Aubrey Allen were awarded Gold for the follwoing products – Chef prepared Beef Bourguignon & Garlic Mash, Guinea Fowl Supreme with wild mushroom & thyme, Garlic Mountain Melt and Pork Chocolate Orange Sausage. The steaks are high at Aubrey Allen! Britain’s passion for dry-aged beef, and the demand by ‘MasterChef’ wannabes for high quality ingredients, has inspired two local master butchers from Leamington Spa to create two new national award winning sirloin steak cuts for fine dining, either in or out of the home. 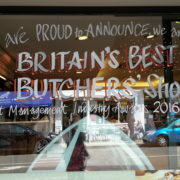 Martin Crombie and Nick Clayton-Gale from Aubrey Allen’s butcher’s shop in Leamington Spa have both won Eblex Quality Standard Mark Excellence Awards this week in London for England’s Best Innovative Steak and England’s Best Sirloin Steak with their ‘One Bone Sirloin Noisette’ and ‘Sirloin Pavé’. The noisette cut developed by Martin Crombie reflects an innovative larder trimmed product using the wing end of the sirloin and is already proving a popular choice amongst customers for dinner parties. The pavé in contrast by Nick Clayton-Gale uses the back-end of the sirloin, is larder trimmed in a circular shape and served with a Café de Paris sauce to create a restaurant quality dish that is equally easy to cook at home. Commenting on the new one bone sirloin noisette, Martin Crombie said that the reason behind inventing this cut was to provide a 6oz – 7oz size sirloin steak for diners who prefer their meat cooked ‘rare’ or ‘blue’. Nick Clayton-Gale added that his sirloin pavé provided a restaurant style prepared product in a raw form. Aubury Allen’s butchers are the first winners of these inaugural Eblex awards, which have been launched to showcase both the creative and technical skills of independent butchers, farm shops and foodservice operators throughout England. Aubrey’s Dry Aged beef is sourced from naturally reared, grass-fed suckler herds that have been allowed to develop slowly. It is then matured for a minimum of 21 days to intensify the flavour and encourage the natural tenderisation that occurs during that period. 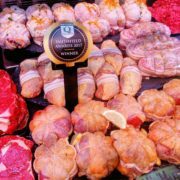 Aubrey Allen is a family owned butchery business established over 80 years ago, with a reputation for supplying quality meat. 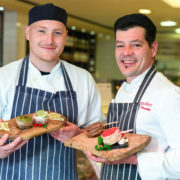 As well as operating a successful retail outlet, Aubrey Allen is a well-respected catering butcher supplying over 400 restaurants and pubs throughout the UK. https://www.aubreyallenleamington.co.uk/wp-content/uploads/2017/04/steaksHighPR.jpg 427 640 Switch Support https://www.aubreyallenleamington.co.uk/wp-content/uploads/2017/11/AA-Header-Logo-INV.png Switch Support2017-04-18 15:57:282017-04-18 15:57:28The steaks are high at Aubrey Allen! 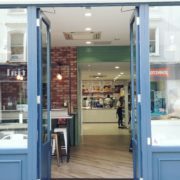 We are delighted to announce that we have expanded into food to go with the launch of Aubrey Allez – a café and takeaway outlet next door to the butcher’s shop and delicatessen. The newly-expanded shop in Leamington Spa provides fresh fast food and drinks that can be eaten in or taken away. The shop features Aubrey Allen’s signature pre-packed sandwiches and an extensive salad bar. There are also breakfast and hot meal options. Among the products available to eat in or take away is a steak sandwich which highlights the brand’s heritage. New season lamb – do you know the difference? Aubrey’s team get spicy in the kitchen for National Curry Week! Aubrey brings home the bacon! This family business started over 80 years ago as a small butcher’s shop in Coventry, and the company has evolved over the years to what it is today - one of the best known butchers in the Midlands and throughout the UK. We have grown through our commitment to making the best quality meat available to our customers. ©2017 Aubrey Allen Limited. All rights reserved. | Site designed by Switch. Design. Brand. Digital.